Huevos rancheros is a well-known Mexican favourite – deservedly so; the flavours and contrasts of textures in huevos rancheros are truly wonderful. Generally, I do what most people do and smother the eggs with sauce – here I have tried to elevate the dish into something more visually attractive. But it doesn’t really matter how you arrange it the flavours are still delicious. 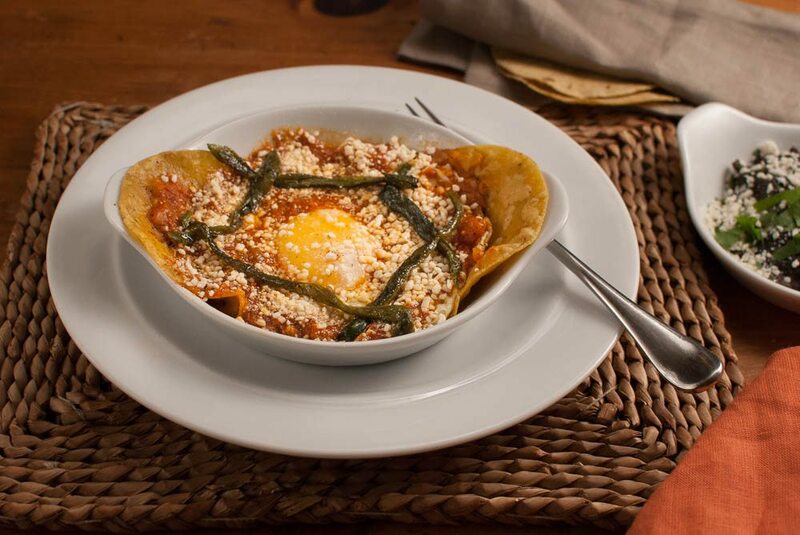 How to make Huevos Rancheros. The ranchero sauce is a typically Mexican method – and makes use of the ever present blender. Broiling the tomatoes and chillies is the key to the distinctive taste. Make the rajas. This is really just roasted peppers done in the style we know for an Italian antipasto. Char the poblano chilli or green pepper and jalapeño under the grill, over a barbecue, over an exposed gas flame or on a cast iron skillet. Put in a bowl covered with cling film for 15 minutes and then peel. Cut the chilli or pepper in strips. NB: the green pepper is not a chilli so mix with thin strips or chopped jalapeño to add some heat. Make the ranchero sauce. Broil the tomatoes, garlic and chillies using a cast iron skillet (or under a grill). Don’t move them around as they need to blacken and blister. It’s all rather coarse and smoky, but that adds to the fun! So open the window and put the extractor on. Take the garlic out first so it is not overcooked. Continue until the tomatoes are evenly blackened but still intact and the chillies are evenly browned and charred. Remove the stem from the chillies (and the seeds if you are worried about spicy heat). Peel the garlic cloves and put into a blender with the tomatoes and chillies. Blend until it is an even but roughly textured sauce. In a frying pan add a tablespoon or more of olive oil and sweat the onion for 10-15 minutes, then add the blended tomato sauce and fry, stirring for 5 minutes, lower the heat and add the oregano and simmer gently for a further 5 minutes. Season with salt. Make the re-fried beans. Drain the beans retaining the liquid. Put a tablespoon of lard or olive oil in a frying pan and heat on a medium high heat. Add the beans and fry. After 3 or 4 minutes use a potato masher or fork to mash the beans. Continue to cook for about 5 minutes. Add some of the retained liquid if the beans dry out. I quite like mine with some browned and crusty bits. Fry the tortillas. Put sufficient vegetable or light olive oil in a frying pan to cover the base in a shallow pool. Heat the oil on medium high heat. Fry the tortillas briefly in the oil and drain on kitchen towels. Wrap in foil and keep warm. Fry the eggs. Do this in a sunny side up fashion – or to your own preference. Assemble the dish. Spread a spoonful of beans on each tortilla – OR serve separately. Overlap the tortillas on a plate and place one or two eggs over the tortillas, pour ranchero sauce over the egg whites leaving the eggs exposed, garnish with grated cheese and chopped coriander or parsley.